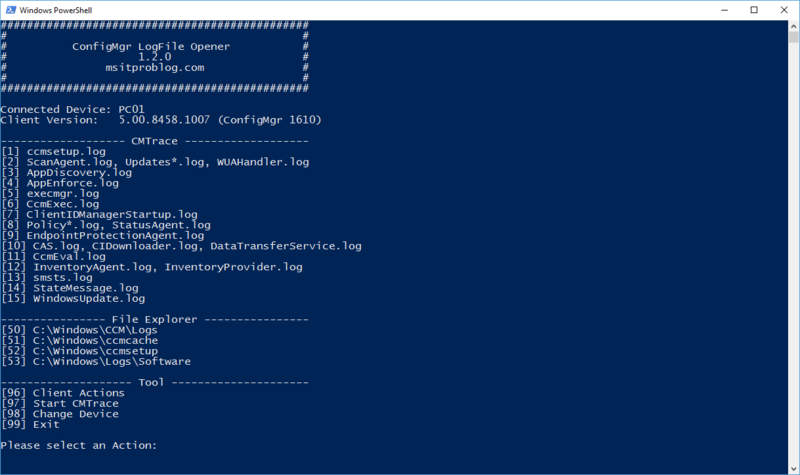 Version 1.2.0 of ConfigMgr LogFile Opener has been made available a few hours ago. This Release comes with a few new features and some bug fixes. Starting with Version 1.2.0, ConfigMgr LogFile Opener requires PowerShell 3.0 or higher. Added a Client Actions sub menu for executing the most common ConfigMgr Client Actions. Added the Client Version to the top of the Menu. Added “StateMessage.log” to the CMTrace Menu. Starting a single CMTrace Instance will now consider the -WindowStyle Attribute.